The Military Medical Academy was a venue for a meeting dedicated to the importance of Valjevo hospital in 1914-1915, the period of the major disease outbreak. The organizers were the Academy of Medical Sciences and the Section for the History of Medicine Serbian Medical Society, National Museum of Valjevo and the Military Medical Academy. The meeting was attended by the Head of the Tradition, Standard and Veterans Ministry of Defence, Colonel Sladjan Ristic, President of the Serbian Medical Society Academician Radoje Colovic, Dean of the MMA Medical Faculty of the University of Defence in Belgrade Colonel Prof. Dr. Nebojsa Jovic. Today's meeting is a symbolic reminder of the main heroes of the story, doctors, paramedics, but also ordinary citizens, united around the same goal, when the whole city turned into a hospital. This deserves a deep respect. Also it is the final part of the Jubilee events related to the Valjevo war hospital and the historical role of the Serbian Military Medical Service during that period. The guests were welcomed by prof. Dr. Snezana Veljkovic from Section for the History of Medicine of the Serbian Medical Society. At the beginning of the meeting, a host Colonel Prof. Dr. Dragan Mikic, the MMA’s Head of the Clinic for Infectious and Tropical Diseases said that this year's event is different from the standard ones, because participants will take the audience in the historic walk through the three media - books, film and photography in Valjevo, when the city was a big hospital, a hundred years ago. First, a book by a Research Associate Dr. Aleksandr S. Nedok "Valjevo – the Serbian war surgical center and city hospital in the epicenter of a major outbreak 1914 - 1915" published by the National Museum Valjevo was promoted, followed by Slobodan Rakovic’s film "Arijus van Tinhoven – Valjevo’s Dutchman", and in a gallery of the MMA amphitheater an exhibition entitled "Valjevo 1914-1915 - the city hospital" by prof. Dr. Vladimir Lazarevic Krivosej and Dragana Ilic produced by the National Museum of Valjevo was shown. 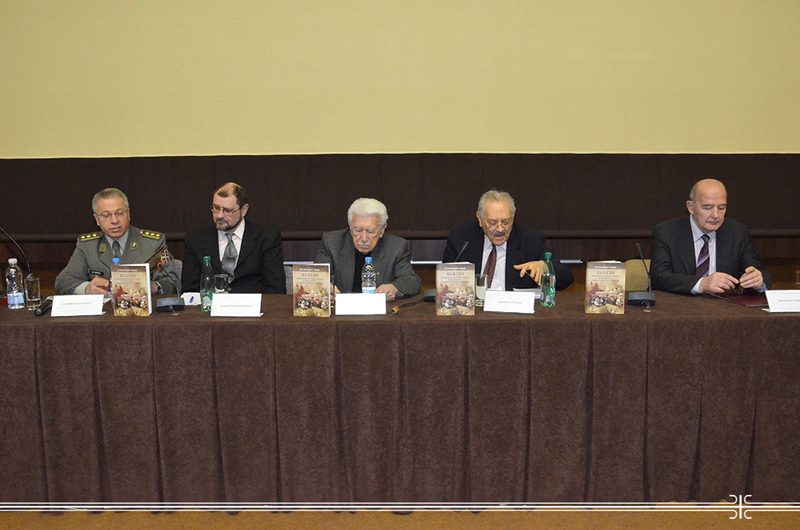 Reviewers - Brigadier General retired Dr. Veljko Todorovic and Colonel Prof. Dr. Dragan Mikic, Major General retired Dr. Branislav Popovic, Prof. Dr. Vladimir Krivosejev on behalf of a publisher spoke about doctor Nedok and his book as well as the author. As they said, Dr. Aleksandar S. Nedok, a longtime full member of the Academy of Medical Sciences of the Serbian Medical Society and an honorary Major of the Serbian Armed Forces, a top expert in the history of the Serbian military medical service, versatile, creative, dedicated and authentic personality, a man who possesses the intellectual eternal youth, a scientist who investigates the events and people who were the bright and human side of war and an inexhaustible working spirit who with his commitment and honorable job, having written a medical history of the Serbian Military Medical Service deserves a place of honor in the history of the Serbian healthcare system. General Popovic pointed out that Dr. Nedok has published 180 papers and even more if we add his assistance to other colleagues and associates. General Todorovic reminded of 150 years of the Nedok family tradition and loyalty to the medical profession and the medical corps. Speaking about the book, Dr. Todorovic said that the book consists of three parts; it has 123 pages with four original documents, 24 tables and charts, as well as original photographs that come from the family archives. Colonel Prof. Dr. Dragan Mikic reading excerpts from the book recalled this dreadful time when the entire city was a hospital. "Gruesome scenes of mass starvation and death, both patients and hospital staff occurred in the hospital... People could not get to bury the dead. A pile of corpses was near the hospital. There were cases that were mistakenly put on heaps of corpses and they were unconscious. " Prof. Dr. Vladimir Krivosejev pointed out as well on the importance of Dr. Nedok’s work, having said that the author made a periodization of all the events that took place in Valjevo for less than a year. Dr. Nedok at the end of the book promotion recalled the time that he wrote about. He spoke of the great battles in that period, the healthcare situation that followed in the army and the people, about the small number of medical personnel in Valjevo at that time - three surgeons and three physicians, two medical students, a lawyer who worked as an anesthetist. Most of them were, he said, young people who sacrificed their lives to help the injured first, and then the patients who were ill with typhus. In this way, he gave the introductory word regarding the film about one of them – a foreigner Arius van Tienhoven, a surgeon in Valjevo hospital.